According to him, the temple issue did "more harm than good" to the BJP as the matter was being used by the opposition "to terrorise minorities and polarise votes". KOLKATA: BJP National General Secretary Kailash Vijayvargiya has said that his party was not thinking of bringing an ordinance "as of now" for construction of the Ram temple at the disputed site in Ayodhya. He, however, asserted that it was only the saffron party that could construct the Ram temple at Ayodhya as "no one else has the guts" to do it. "We would appeal to the court once again for a verdict on the issue (Ram Mandir). When a matter is in court, we should not be in a hurry and give it enough time to take a decision. But if people's aspirations keep increasing, the government will have to take a call on it (whether to bring ordinance or not). As of now, the party is not thinking of bringing in an ordinance on construction of temple," Vijayvargiya told PTI in an interview. The Supreme Court has recently declined an early hearing of petitions in the Ram Janmabhoomi-Babri Masjid title dispute case. It had earlier fixed the case for the first week of January before an "appropriate bench", which will decide the schedule of hearing. When asked about the growing clamour for ordinance by various organisations and political outfits such as Vishwa Hindu Parishad (VHP), RSS and Shiv Sena, he reiterated that they would have to appeal to the court for an early verdict. Thousands of devotees thronged Ayodhya on November 25 to attend VHP's 'Dharam Sabha' to discuss the Ram Mandir issue, with a senior religious leader asserting the dates for building the temple would be announced early next year. Last week, NDA-ally Shiv Sena's chief Uddhav Thackeray said the BJP government at the Centre "may not last" if the temple was not constructed in Ayodhya, warning that "emotions of Hindus should not be taken for granted". 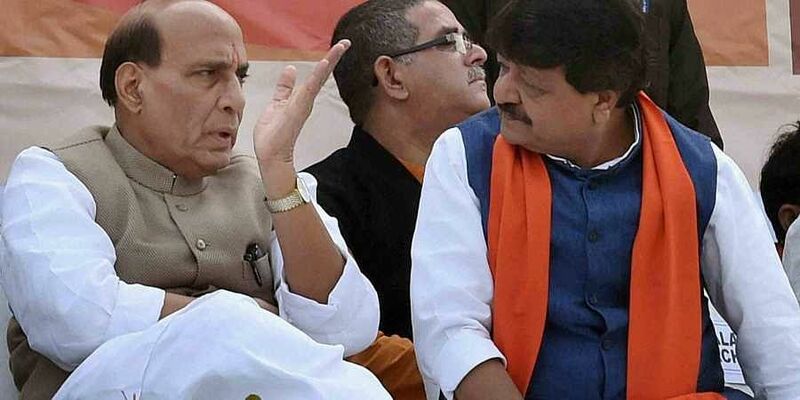 Rubbishing opposition claims that the saffron party rakes up Ram Mandir issue for political benefits ahead of elections, Vijayvargiya said, "The BJP has not raised the matter, it was saints and other organisations that did. The party has never gone into polls with Ram Mandir issue. For us, the agenda has always been 'Sabka Sath Sabka Vikas'," he said. He alleged that opposition parties have been trying to harm the party's prospects by intimidating minorities with the temple issue. "During elections, some sections of people raise this issue just to terrorise minorities. The issue doesn't help the BJP, rather it causes damage as minorities en bloc vote against us," he claimed. Vijayvargiya, who is the BJP in-charge of Bengal, said the saffron party would wish to build the temple, keeping the court's decision and Constitution's provisions in mind. "Only BJP can construct the Ram Temple, nobody else has guts to construct the Ram temple. We will do it. But we will do it by respecting the court, Constitution and social fabric," he said. Congress leader C P Joshi had recently said that only his party's prime minister would be able to build a temple at Ayodhya. Talking about assembly polls in five states, he expressed confidence that BJP would score well in Telangana and form governments in Rajasthan, Madhya Pradesh, Chhattisgarh and Mizoram. When asked whether the election results in five states will have any impact on the Lok Sabha polls, he said state elections and parliamentary elections should not be mixed up as issues in two cases are very different. "The issues in both polls will be completely different. When assembly elections take place, state leaders are making a pitch. In Lok Sabha polls, the party will pitch national leaders. When (Prime Minister) Narendra Modi will come into play, all other faces will take a backseat." Vijayvargiya, however, acknowledged that victory in elections always act as a "morale booster". "Yes it (poll results) will have some impact because winning polls act as morale booster, losing may demoralise workers a bit. But under the leadership of Modiji we would overcome all problems to form the next government again," Vijayvargiya, who hails from poll-bound Madhya Pradesh, said. Rebutting opinion poll results which stated that the BJP might face a rout in three states in the Hindi heartland, the party's national general secretary said, "These predictions do not reveal people's aspirations, it is done on the basis of small samples that can't be a true reflection of what masses want". He also claimed that opposition parties won't be able to unite as there were too many contenders for the prime minister's post. "People want a stable and a strong government. The opposition front has too many prime ministerial aspirants and that won't work in their favour," he added.